At Mass at the Cathedral of St John the Baptist in Norwich to celebrate the 40th anniversary of the Diocese of East Anglia, on the Solemnity of the Sacred Heart, 3 June, Cardinal Vincent preached the homily in which he gave thanks for the diocese. Using the cathedral as the starting point of his reflection, the Cardinal spoke of the reasons to be thankful on this anniversary. Pointing to the images of Ss Felix, Etheldreda and Edmund in the chancel, he said that these saints ‘remind us that faith in these parts is as old as the hills’ and ‘offer us a challenge to be diligent in our mission to live out the faith, playing our part in the continuing story of Christianity in East Anglia now and into the future’. The Cardinal spoke of the continuity of faith represented by the cathedra, the ‘chair of the bishop, around whom the flock of the diocese gathers’, giving thanks for all who have served as Bishop of East Anglia, beginning with Bishop Alan Clark to the present-day Bishop Alan Hopes. 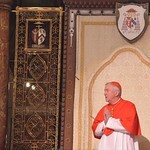 Speaking of the old high altar and the current altar, he said they were ‘powerful reminders to all who enter the cathedral of the centrality of the Eucharist to our Catholic faith’. Referring to the Eucharist as ‘the very heart of our faith’, he explained that ‘it is the person of Jesus, with us constantly, opening his arms to us in welcome, urging us to come to him, to lay down our burdens at his feet so that we may stand tall again and go out, ready to be his heralds’. The Cardinal also spoke of the influence of Our Lady of Walsingham, the principal patron of the diocese, whose shrine located within the diocese, is ‘truly the shrine of the Holy Family, the inspiration and challenge to all families today’. He invoked ‘the intercession of Our Lady of Walsingham, full of confidence in her motherly care’. The principal celebrant of the Mass was Bishop Alan Hopes of East Anglia. Among the concelebrants were Archbishop Peter Smith of Southwark, who was the second Bishop of East Anglia, and Archbishop Antonio Mennini, the Papal Nuncio.